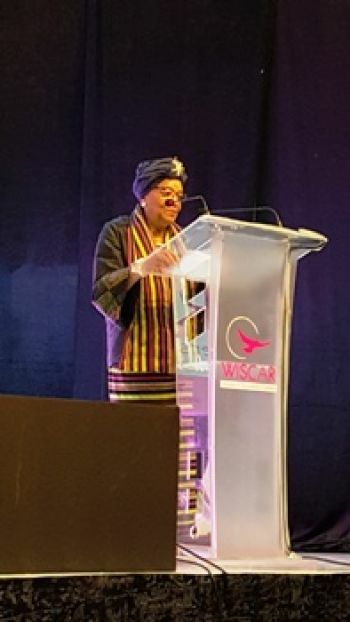 (Lagos, Nigeria, November 25, 2018):Former Liberian President Ellen Johnson Sirleaf has received the 2018 Distinguished Women in Successful Careers (WISCAR) Award for excellence in leadership and good governance. A release from the Liberian Embassy in Nigeria says the WISCAR board conferred the award on her at the 2018 WISCAR Leadership and Mentoring Conference at the Muson Centre in Lagos, Nigeria, on November 25, 2018. In her keynote address, titled “Enriching Lives by Telling Our Own Stories,” Former President Sirleaf chronicled her life path to leadership as one which was non-linear, but filled with struggle, challenges, determination and a strong will to achieve excellence. The road was undulating and sometimes met with failed outcomes, she said, as it happened when she first ran for president in 1997. But she advised women to embrace failure, because it was “success upside down,” which can be turnaround with perseverance and determination. She said she went to jail on two occasions because of her advocacy for social justice and human rights. Youth and women, including market women, played catalytic roles throughout her labor for justice, the release continues. On becoming president, she narrated that she was confronted with many encounters to rebuild nearly everything that was broken by civil strife and had to be fixed. She had to mobilize the resources to expand the budget, rebuild the economy and infrastructure, provide rule of law, and revitalize basic services including health and education. She set up a trust to build 50 schools, with 500 trained teachers, for 5,000 girls. Many competent women were appointed to strategic positions, including justice, the police, foreign affairs commerce, and agriculture. The pinnacle of her success was to turn around a war-torn nation into a peace conflict success story resulting into successful democratic elections that ushered in a new administration after her two tenure in office of 12 years. She hoped that her life travails and successes as the first democratically elected female president in Africa will inspire Nigerian and African women women to “find their voices,” in whatever careers they pursue including political leadership. According to the release, the program was attended by many female students from Lagos area schools, and a host of distinguished panel speakers. The Lagos State Commissioner for Women Affairs and Poverty Alleviation, Mrs. Lola Akande, represented the Governor of Lagos State, Akinwunmi Ambode. The Oba (King) of Lagos His Royal Majesty Rilwan Akiolu was also represented. Nigeria’s Minister of Trade and Industry, Dr. Okey Enelamah made opening remarks, while Liberia’s Ambassador to Nigeria, Prof. Al-Hassan Conteh delivered a Good Will Message. WISCAR’s advisory board members and sponsors also graced the occasion. Meanwhile, WISCAR closed the conference with a gala night of reflections on the day’s program at the Eko Hotel in Lagos, where Nigeria’s 2019 Presidential candidate, Madam Oby Ezekwisili, who is Former Vice President of the World Bank and Former Minister of Education of Nigeria, presented a stirring speech to inspire the young WISCAR mentees.